House guests this weekend. A couple of outings to show them what it is like here abouts. Beautiful weather so outdoors is an option. There's something later in the morning but I decided we'd all enjoy a visit to Tassot Apiaries, where my friends Jean-Claude and Beatrice have their bees. 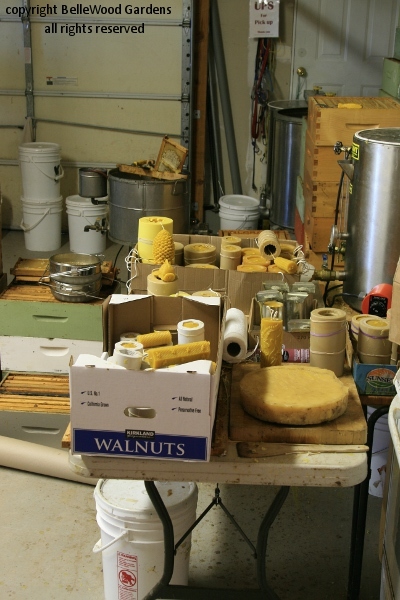 Buzzing Acres has a great shop with all sorts of bee-related products that they make here. We walk down the path between the alpaca pasture and the chicken house and run. Bees, happily buzzing in the mild sunny weather. 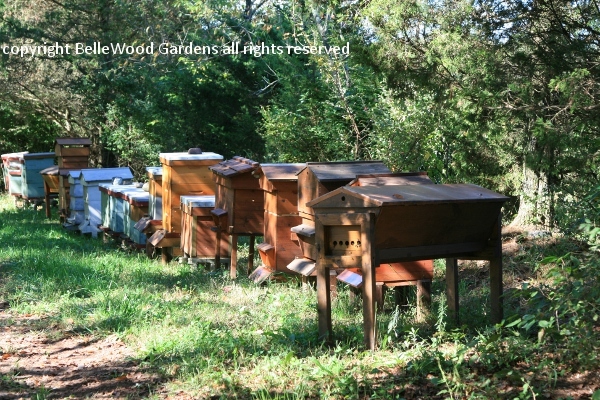 Different styles of hives. Jean-Claude could knowledgeably explain the variations but he's in the kitchen bottling mead. Everyone knows bees make honey. But there's so much more. The honeycomb is made from beeswax. The frames are lifted from the hives and brought inside for processing. The caps are cut off each cell, honey centrifuged out of them. 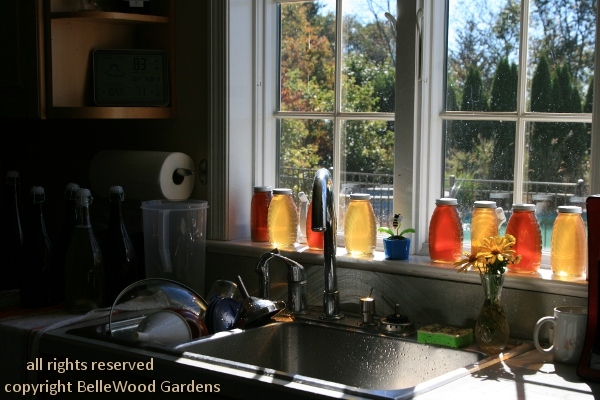 The wax is melted, remaining honey extracted. Then the wax is heated. It rises to the surface and when it cools you have a cake of beeswax. This is a cake of cleaned beeswax, useful for so many things. 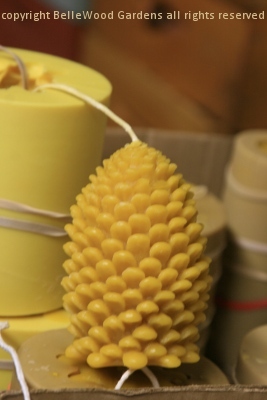 Such as beeswax candles. 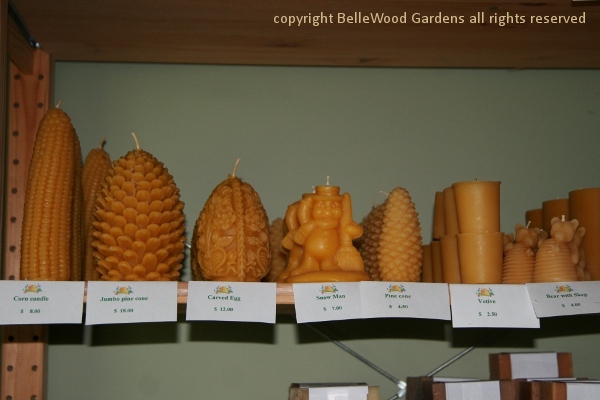 Here's a look at the candle-making area of their workshop. 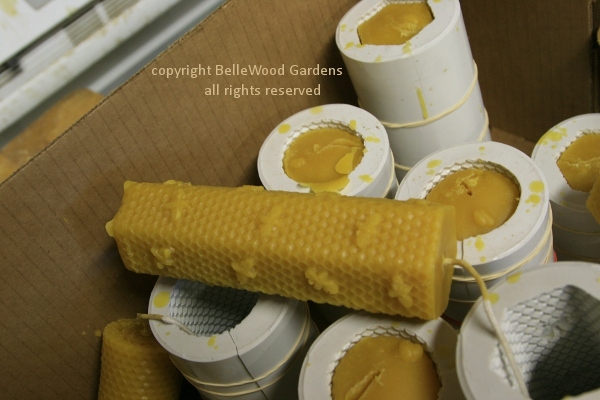 The flexible molds (many of them ordered from England) are banded shut, then filled with liquid beeswax. 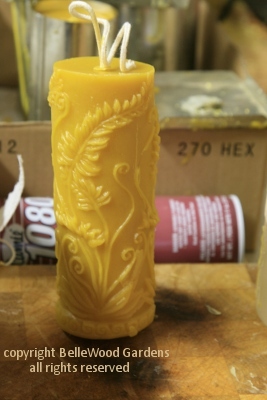 These candles have a charming embossed pattern of honeycomb and bees. and a beautiful fern frond pattern on the right hand cylinder style. 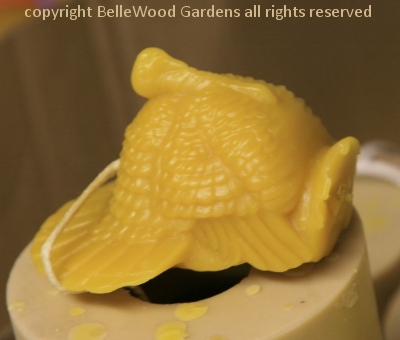 Getting ready for the holiday, a turkey shaped candle just perfect for Thanksgiving. Candles for sale in their shop. There are traditional tapers, pillar candles, and fancy designs. Of course they sell honey too. 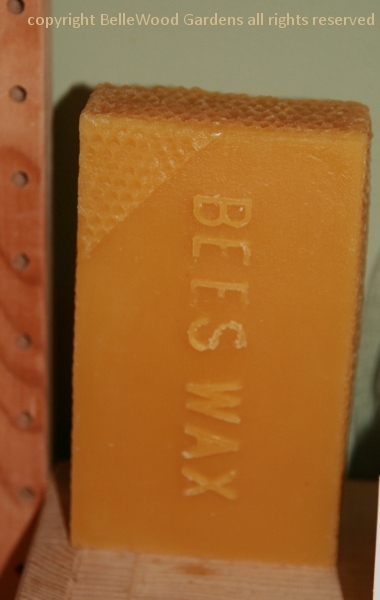 And beeswax both in cakes and incorporated in lip balm, furniture polish, soaps. Busy bees, and busy Jean-Claude and Beatrice. 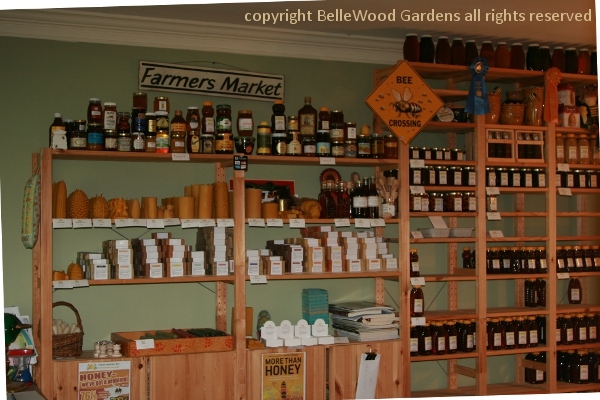 If you cannot make a visit to Buzzing Acres or to one of the farmers markets at which they sell, you can buy on-line.